Three cheers for new stuff from Maplelea! 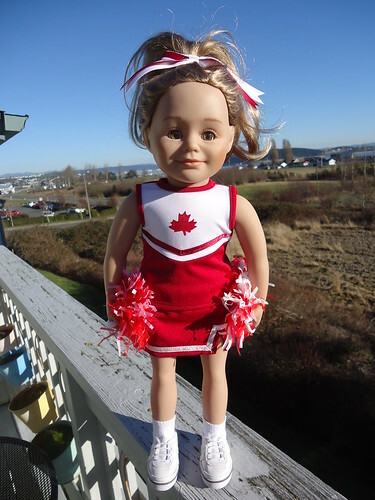 This one’s called Pom Pom Power and comes with a skort, top, socks, shoes, pompoms, and a hair ribbon. Cuteness. Makes you wanna go out and be active, eh? Today I post photos of the New Orleans-themed celebration going on at my house. 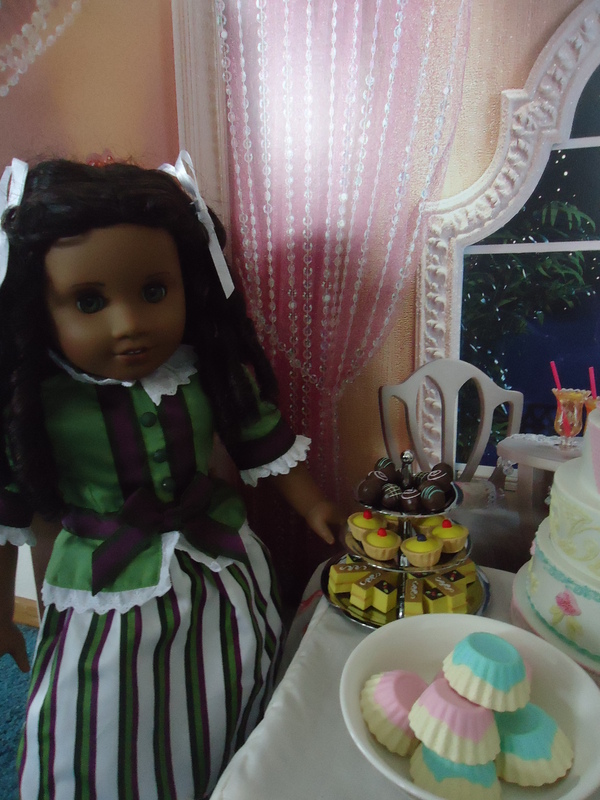 I guess the dolls figured a celebration is needed because Cecile and I made it home safely from New Orleans. 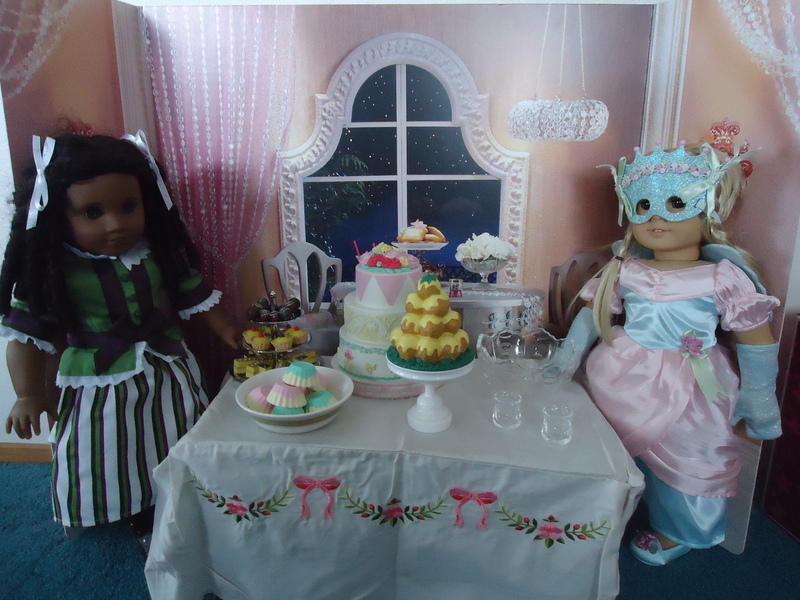 Pictured are Cecile in Marie-Grace’s party dress and Kailey in the fancy dress and some accessories for a Mardi Gras celebration, which are from Cecile and Marie-Grace’s collection. They are showing off their new banquet table and treats. Everything on the table came with the table, including the glassware. 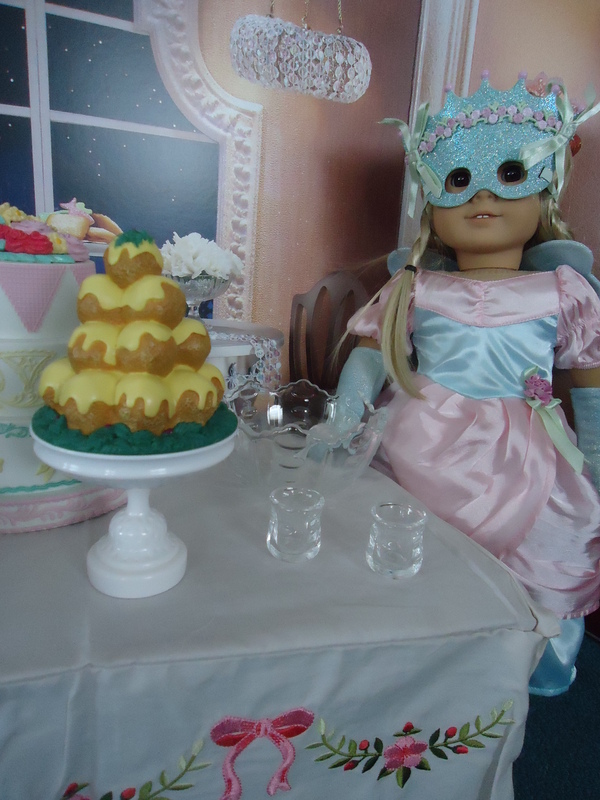 The backdrop is from American Girl too. I would like to challenge everybody to celebrate this week. Throw a party for no good reason. Do something that makes you happy. Life is a gift. No matter how icky things get, you can find something good. Celebrate that something. I’m going to Disney World–Where Dreams Come True. What are your dreams? 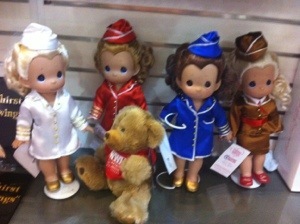 New dollies out of the box! 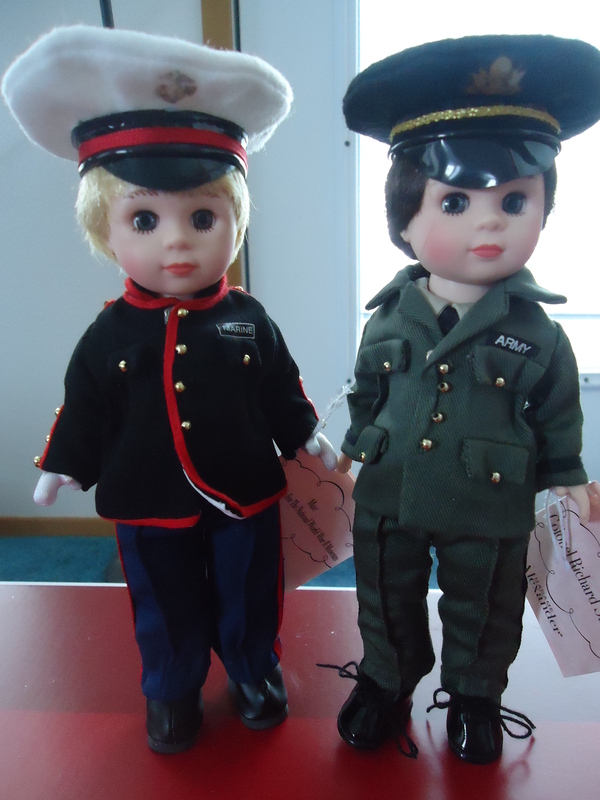 Mac and Colonel Richard Stillman are thrilled to be making their dolly blog debut. Past credits include the gift shop at the National WWII Museum. Colonel Stillman almost didn’t make it home. He was in my suitcase that got lost, then found, then lost again. 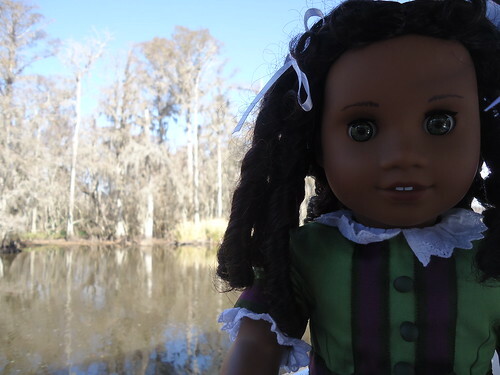 But it finally got found, so now I have two new dollies. The end. So, I don’t have any new Maplelea photos this week because I’m still on vacation. 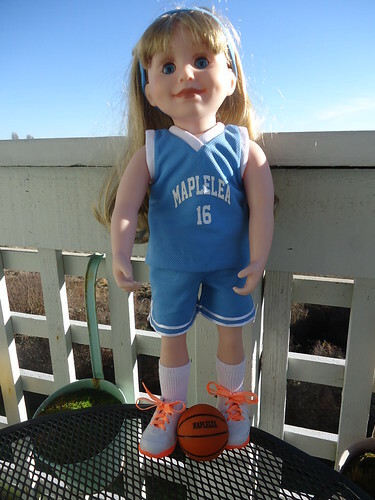 To make up for it, here’s a big pile of Maplelea photos, divided by girl. Float over images to get a description of the outfit. 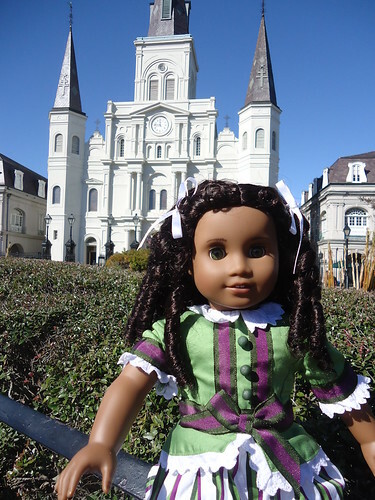 Cecile and I went to New Orleans this week. Here are some adorable photos. 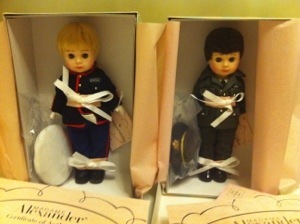 And dollies that I did buy. At 75% off, they were impossible to resist. 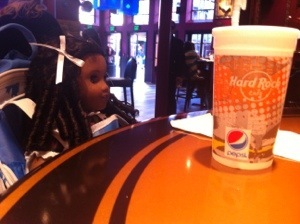 And the waitress at Hard Rock brought Cecile a cup! 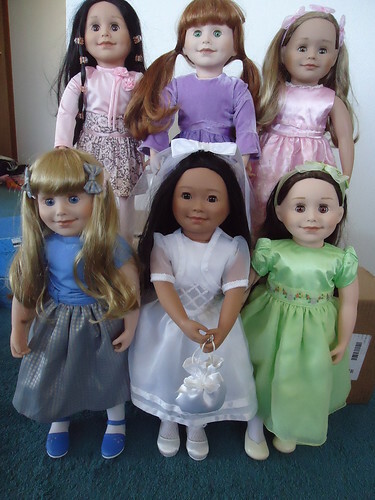 Alexi is wearing Brianne’s Tea Time Terrific, Jenna is wearing Saila’s Sweet Saxifrage, Leonie is wearing Brianne’s Ribbons n Lace, Brianne is wearing Jenna’s Melody in Blue, Saila is wearing Leonie’s Special Occasion Outfit, and Taryn is wearing her junior bridesmaid dress called Apple of My Eye. In the journal pages that accompany Brianne’s fancy pink dress (Ribbons n Lace, the one that Leonie is wearing) she talks about an early Christmas gift from her grandmother: tickets to the Nutcracker ballet! I gave my mother tickets to the Nutcracker for Christmas! Tchaikovsky wrote only three ballets in his life: Swan Lake, Sleeping Beauty, and his last, the Nutcracker. All three are well-loved classics. Although the Nutcracker was performed for the first time in Russia in 1892, it took until 1954 for a full-length version to be staged by George Balanchine in North America. His choreography inspired the many versions that have played around the world ever since. The Royal Winnipeg Ballet was founded in 1939 and is the oldest continuously operating ballet company in North America. Leaving on vacation tomorrow! Have a great day! My name is Marjorie. In most respects I am a grown up, in that I'm old enough to be a grown up and I have a full time job. I'm Marjorie. I'm a grown up. I love my dolls. I'm a Mormon. 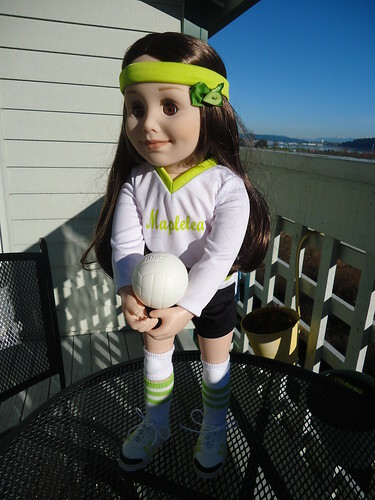 I have recently decided to dedicate this blog to my dolls. Maybe I think they need to make more friends on the internet. 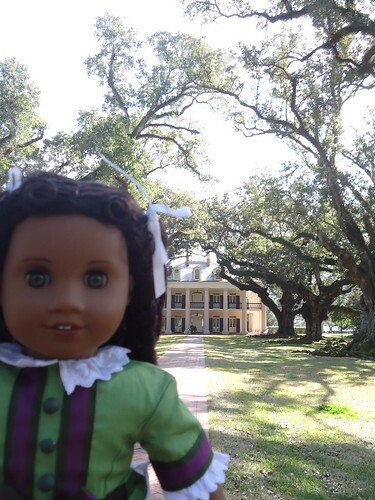 I currently collect American Girl, Maplelea, A Girl for All Time, and Carpatina. 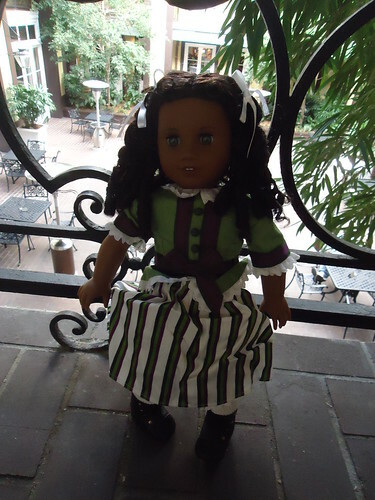 I have others too...I look forward to you meeting all of my dolls. Have a nice day.